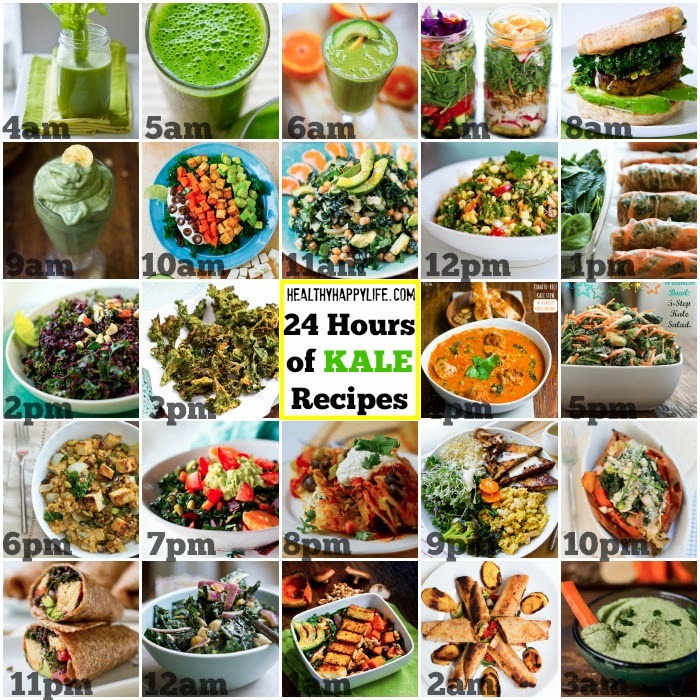 24 Hours of Kale Recipes! Today is Kale Day 2014. Who knew, right? Well in honor of this super VIP, er VIV veggie, I am sharing 24 hours worth of my favorite vegan kale recipes for the green god or goddess in all of us. I promise, even if you look at a fluffy bunch of kale with a blank stare in curious wonderment, there will be a glorious recipe for you. And for any hour of the day. What time is it now? I have a kale recipe for that! From my accessible go-to 5-Ingredient Kale Salad to my gone-in-a-flash delicious kale chips and even a glorious sweet green kale-infused beverage. Lets get our kale on with 24 Hours of Kale Recipes! LETS GO! 24 Hours of Kale Recipes: Because if you are hungry, any time of day, there is a kale recipe for that! * 4am Green Start Sip: Wake up (very early) with this Vibrant Green Tonic .. but add a handful of kale to the recipe! 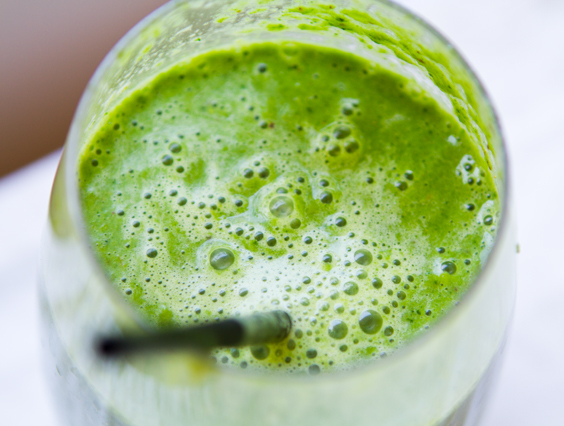 * 5am Green Drink: Kale-infused green smoothies to wake you up! * 7am Jar it! Wake up early and prep a kale-filled salad-in-a-jar for later in the day on if you are on the go, you can even nibble the ingredients as you prep the jars! * 8am Breakfast Sandwich! 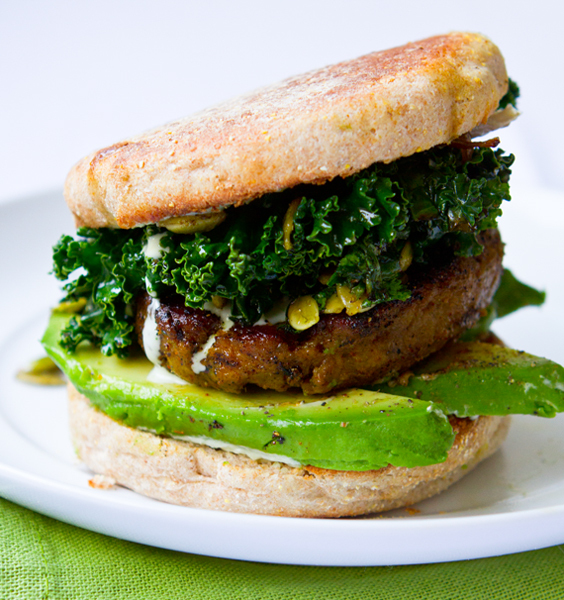 This kale-infused vegan breakfast sandwich with avocado will fuel your day a delicious way! Husband and boyfriend-approved! 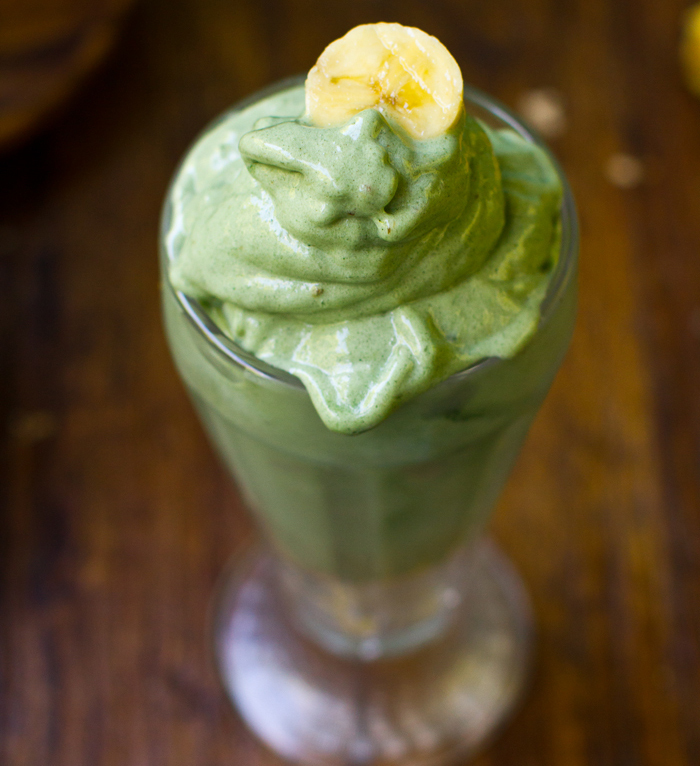 * 9am Kale Shake: OK, so this is a recipe for a spirulina-infused Sweet Creamy Frosty Green Shake (a favorite recipe! ), but all you have to do it omit the spirulina and sub in a big handful of kale to have the same delicious GREEN results. Kale shake shake shake. * 10am Taste the Rainbow: Sometimes life calls for a breakfast salad. 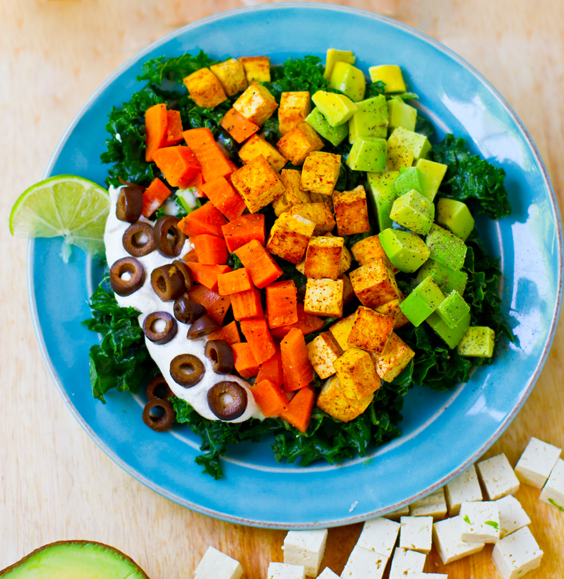 This Mexi-Chop Rainbow Salad on a bed of kale is delicious any time of day, even breakfast! * 11am Power Fuel AM Salad: Green Power Tower Kale Salad with avocado and chickpeas, because sometimes you need a monster-sized, amazing-tasting vegan salad to perk up your day. This delivers! * 12pm Summer-y Salad: This raw veggie-infused, energizing Kale Corn "Summer Reboot" Salad with sweet tahini dressing is a sunny step in your day of food. * 1pm Rolled Up Lunch: Ginger-Peanut Kale-Stuffed Rice Rolls - handheld way to eat your greens! * 2pm Grains + Greens Lunch: Dreamy Black Rice Kale Salad is a delicious mixture of healthy black or purple rice (antioxidant-infused!) and robust, amazing kale salad. This is super healthy and super cravable fuel for your day. 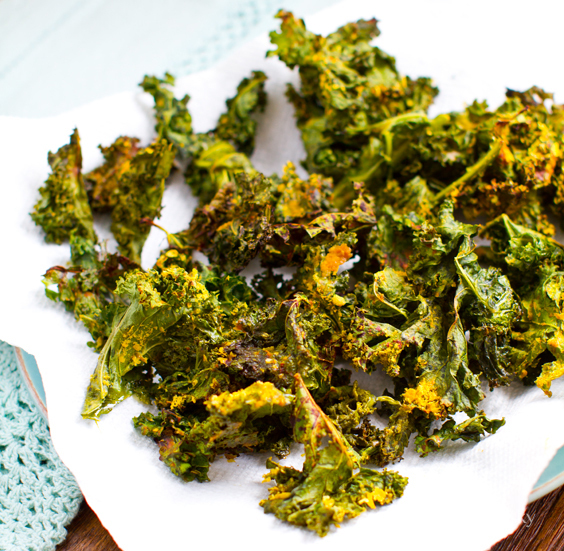 * 3pm Snack Attack: Cheezy Kale Chips! or Spicy Cheezy Kale Chips to the rescue! 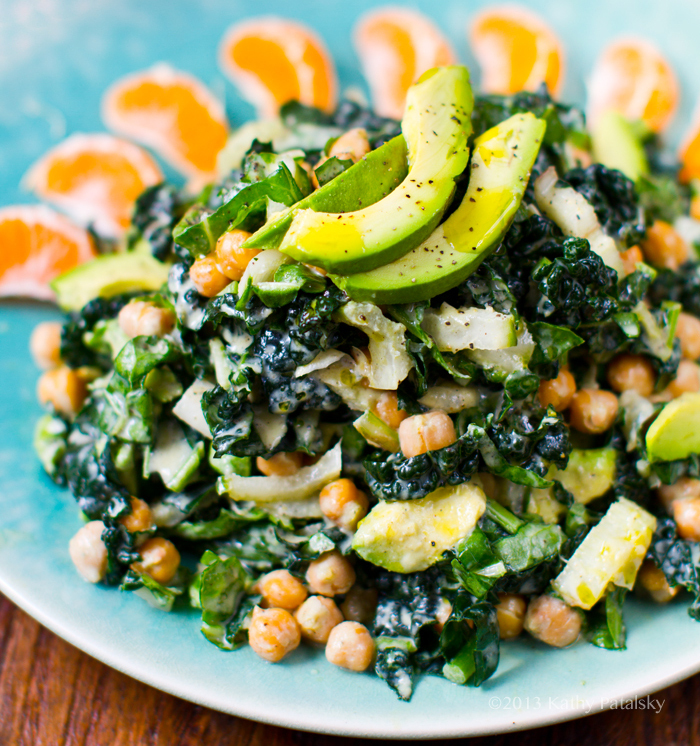 * 5pm Early Dinner Go-To Salad: You always have time to make this easy 5-Step Raw Kale Salad! And did I mention it tastes ah-mazing? * 6pm Cozy Food Bowl: One amazing bowl filled with whole grains, protein, kale, seeds and loads of flavor. You will crave this fall-perfect Pumpkin-Pistachio Kale Fried Rice Bowl with tofu cubes. * 7pm Sunset Salad: When the sun dips down into the horizon, serve up this California Sunset Salad. * 8pm Fiesta Food Dinner: If you love enchiladas, these swoon-worthy creamy cheese and greens-stuffed gems will wow you and your family. This is a sit-down family-style dinner to remember! Cashew Cheese and Kale Enchiladas Rojo to make them remember what cravable family meals can taste like ... with a hint of fiesta flair! * 9pm Macro Meal: I love adding kale to my Vegan Macro Meal! Perfect way to end a day. * 10pm Sweet Potato Comfort: Sweet potato lovers unite. Dive into these kale-stuffed and over-stuffed sweet potatoes for a late cozy meal. * 12am Midnight Snack, Kale Style: I could devour a bowl of this Spicy Peanut Kale Salad ANY hour of the day. Chilled from the fridge, this is a healthy midnight snack! 1am Cozy Butternut Bowl: If you are up this late, a cozy bowl will taste amazing. This Butternut Bliss Fall Salad on a bed of kale greens will soothe your soul. * 3am Late Night Munchies: Choose this Kale Dip with veggie sticks and go back to bed! Whew! We did it! So, did you find something green to inspire you??? I hope so! If you liked this 24-Hours of Kale food special, please share it with your friends using the share links above and below! Be sure to mention me so I can say thanks for sharing @lunchboxbunch of twitter and facebook or @kathypatalsky on instagram. PS. FindingVegan.com Newsletter If you love amazing vegan recipes, be sure to sign up for my FindingVegan.com monthly newsletter! The latest spooky issue for Halloween is HERE. Thanks and kale wishes and green dream smoothies to you all. Happy Kale Day!